Review date: 2nd August 2007. Sometimes I get overcome by the sheer excitement of working in the IT industry. Doing product reviews can be pretty neat. You can get to play around with some nifty cutting-edge gadgets. It is, however, about practicalities. 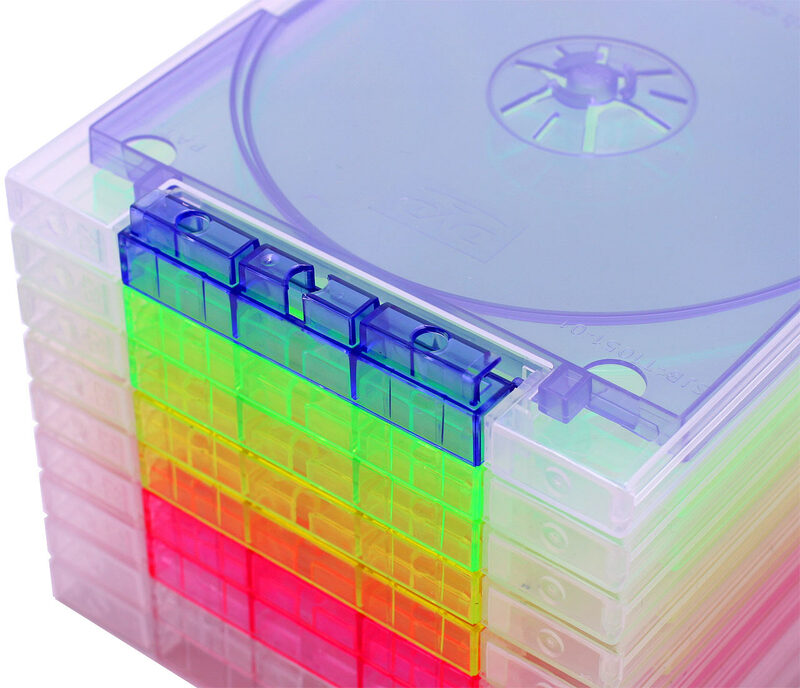 If you deal a lot with optical media, you'll know that there are certain... challenges... when it comes to organising large numbers of 120mm discs in a vaguely sane way. Various storage solutions have come and gone over the years, some more successful than others. Dan's looked at a few in his time. Today I'll be taking a quick look at two products. One for storing CDs, and one for managing a problem you probably never even knew you had - dispensing blanks. This little cube of colourful, hard-to-photograph plastic is actually a block of 10 individual CD cases. It's sold as a single unit, under the illustrious title "Magic Drawer". Quite a lot of IT products are, or have been, "magic" over the years. I'm not sure if this takes away from the concept, or helps ground its unreality. 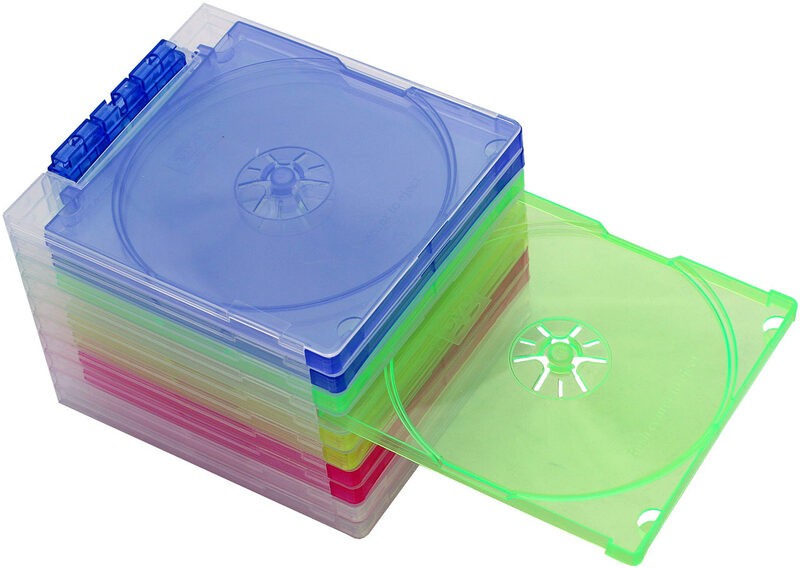 Either way, what we have at the end of the day here is a set of cases for CDs or DVDs. The Magic Drawers do have a few tricks up their sleeves (no puns intended), though. First of all, they're modular, and stackable. Here's a single tray. 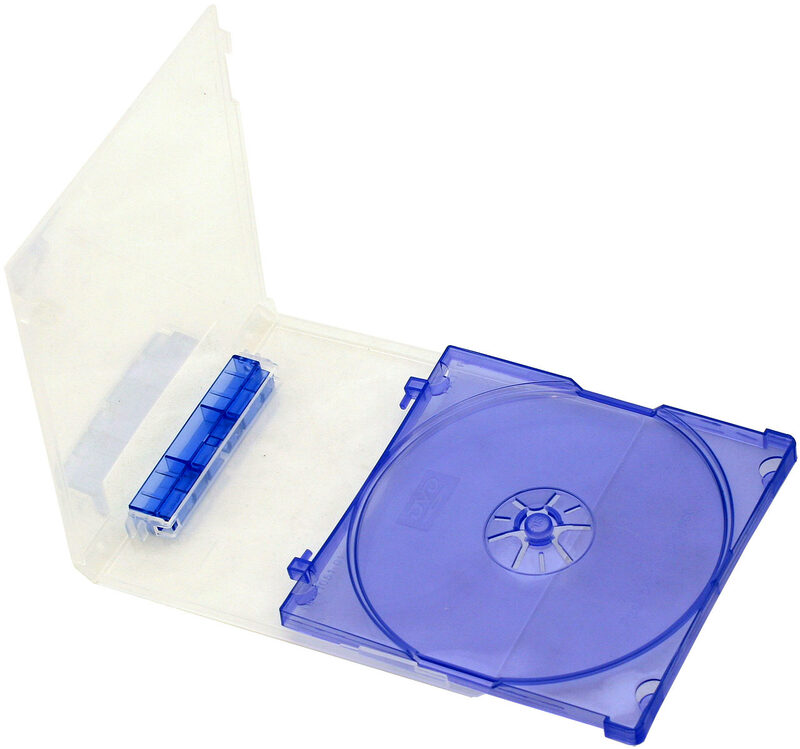 As you can see, it's made up of a couple of separate pieces of plastic, and can be opened like a normal CD jewel case. The trays are stuck together using this Lego-brick arrangement at the back. The connectors are hinged, so you can fold them inwards and out of the way, which is nice if you want to carry around a single tray. The connectors also let you stack blocks of the Magic Drawers as high as you like (within reason), so you can keep buying extra sets when you need to add to your collection. ...or, more practically, you can pull them out one at a time. The drawers can be completely removed, and there's a pushbutton arrangement in the middle to release the disc from the holder which works significantly better than your standard jewel-case release mechanism. There's not much else to say about the Magic Drawers, except that they're made out of the tough, softer plastic polypropylene (you can tell by the feel, but also more accurately by the resin identification code [well, sure, if you don't want to do it the interesting way... -Dan]), rather than the cheap, ever-so-crackable polystyrene that's used for normal CD jewel cases. I thumped the Magic Drawers quite solidly (just to show them who was the boss) and all they did was bend temporarily. You also get a set of stick-on labels for the drawers, and some little rubber feet, which you can use to better anchor your stack to the desk. W00t. As far as disc stacking solutions go, I've seen far worse. If you need a relatively modest number of discs on hand, a few sets of Magic Drawers are a much better option than just stacking your jewel cases. The Australian version of the Magic Drawers is branded as a "Skymaster" product, but like many OEM imports, the same thing's available under various other brands internationally. For example, this product, branded as "Compucessory", looks very much like the same animal for U.K. shoppers. 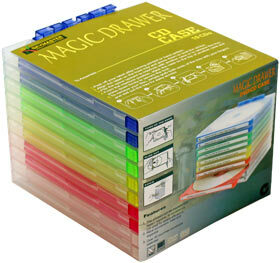 For people in the USA, Amazon and Kmart appear to sell Magic Drawers too. Here in Oz, Aus PC Market sell the Magic Drawers for $AU15.40 including Australian delivery (Aussie shoppers can click here to order!). 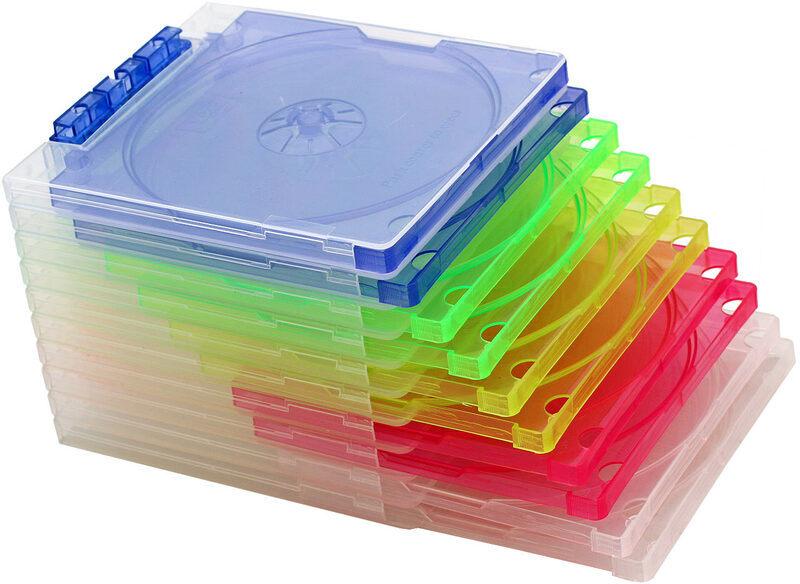 You get ten drawers for that, which makes them significantly more expensive than standard empty jewel cases - but they'll last a lot longer, and they're much more elegant as a stacked solution if you have a small to moderate number of discs. Now on to the gadget that solves the problem you never knew you had. 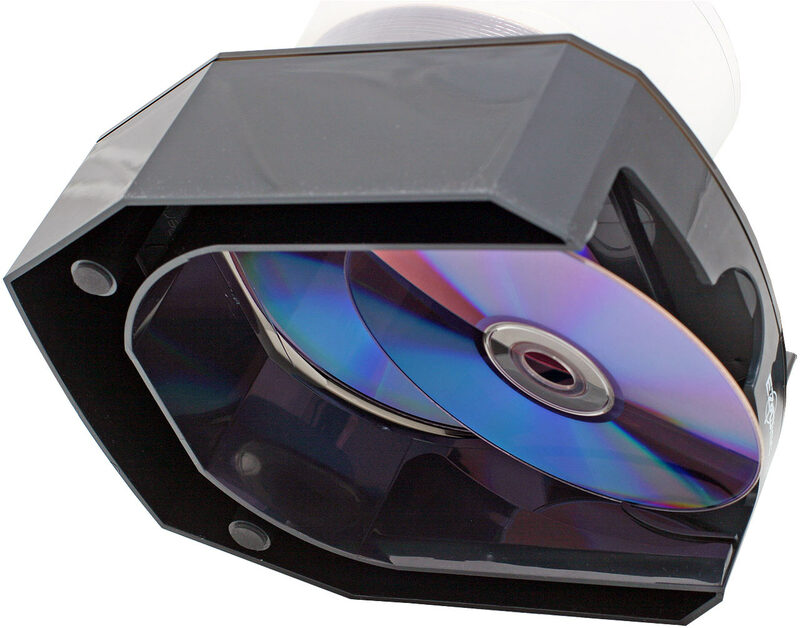 When you want to burn a CD or DVD, do you get sick and tired of having to reach over, open the CD spindle, take a blank disc off it, and put the lid back on? But let's say you're into burning lots of discs. Or you're lazy, and all the computer hacking is making you thirsty. You'll get your TAB a lot sooner if you don't have to faff around with cake box lids! Well, wouldn't you know it - there's a gadget for you. Basically, what the disc dispenser does is... dispense discs. You upend a full spindle of blanks into the top, and clamp on the lid. And then, whenever you need a blank disc, you pull the little lever. And a disc pops out the bottom. You can see the highly complicated action of the mechanism in the next picture. It's pretty simple, but effective. Here's the view from the bottom, with a disc in place. 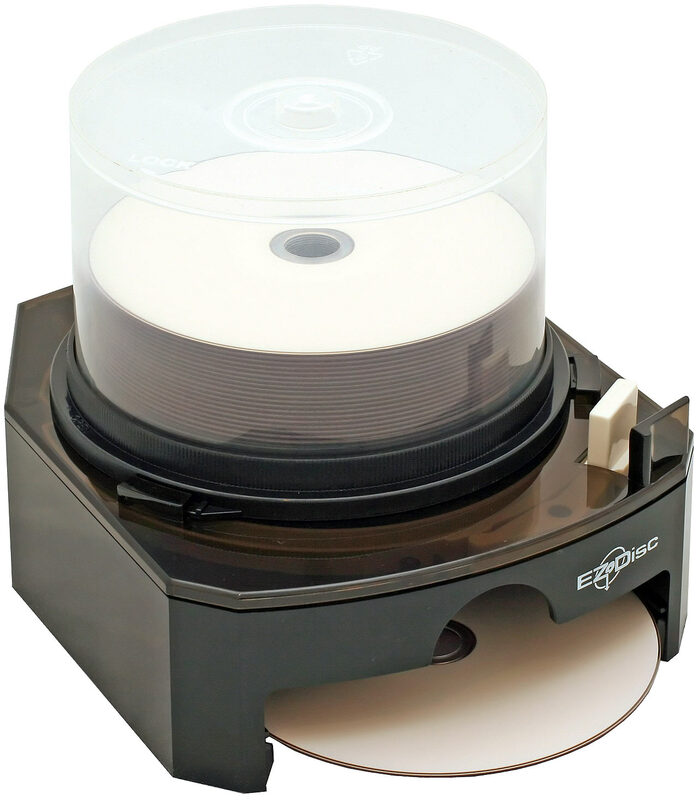 The dispenser only touches the disc by the very edges, so scratches shouldn't be a problem. The disc also pops out far enough that you can grab it by the centre hole and edge, and thus not put fingerprints on it either. There's not much to say about the E-Z Disc Dispenser. It doesn't do much, but what it does do, it does well. The mechanism's simplicity makes it very reliable. Here's the dispenser loaded with 50 discs. According to the documentation, you can use it with stacks of blanks up to 100 high (the biggest kind of spindle you can buy, as far as I'm aware). 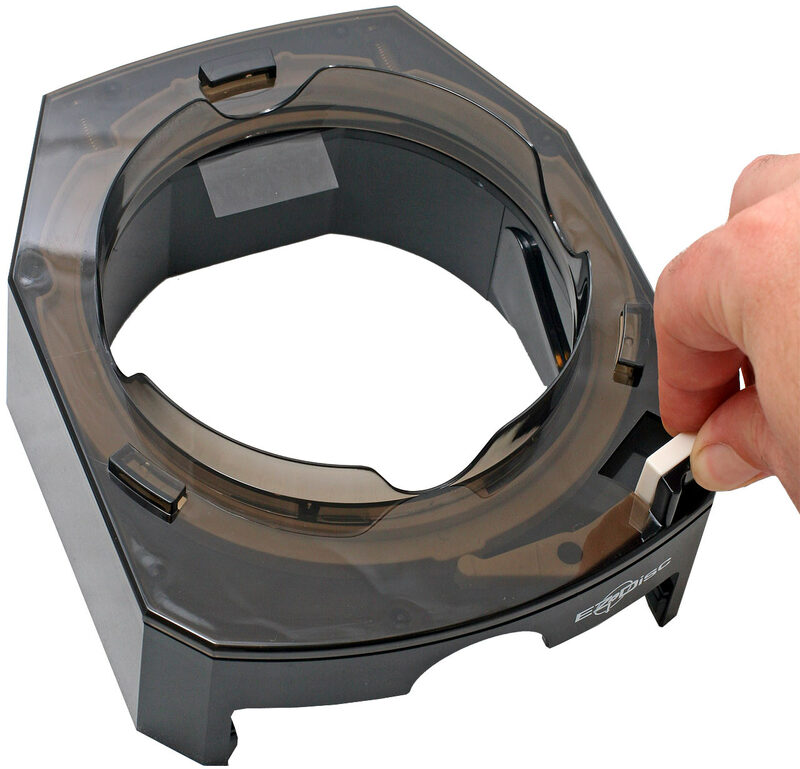 The tub that holds the discs in place on top of the dispenser is the one the blanks come with; it attaches to the dispenser with the same twist-lock mechanism that held it onto the base of the spindle. You don't get a tub with the dispenser, though, so if you buy your blanks in shrink-wrapped stacks (woe betide you if the wrap tears when there are still 192 discs on the stack...), you're going to have to decant them into a tub before you can use them with the dispenser. Empty disc tubs are not exactly a rarity in the nerd world, though, so you'll probably be able to cope. Aus PC Market are, once again, the provider of the review version of this miracle gadget. Australian shoppers can streamline their disc dispensing experience for a mere $AU20.90, including Australian delivery; you can click here to order. The rest of the world can find the same thing on Amazon, again. At such a price, you'll probably know if you want it or not. Me, I'm a "not", but I don't burn all that many discs. If you do, it will definitely make life just that little bit easier. And I have to admit that it's also kinda fun to use. 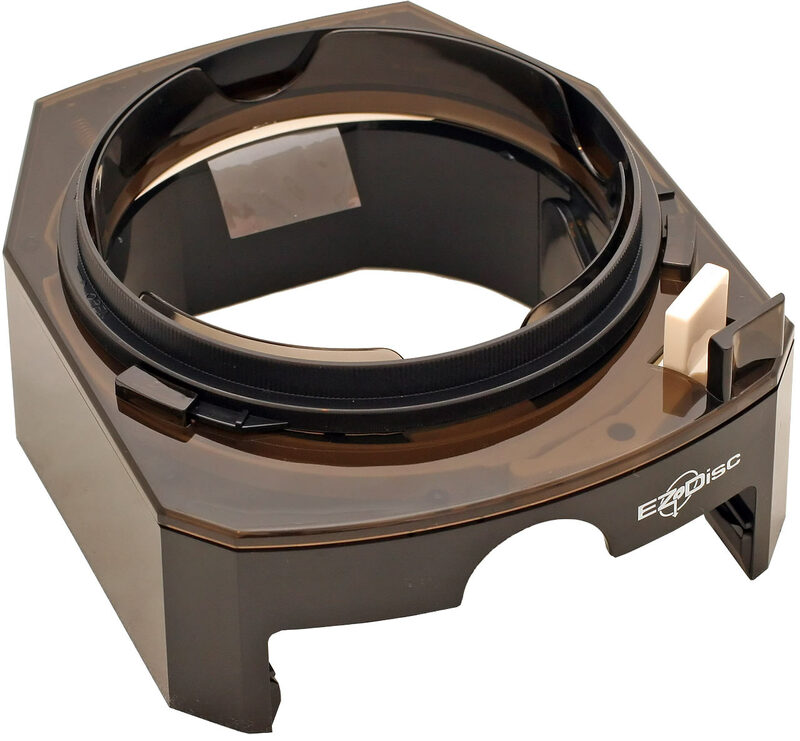 Australian shoppers can click here to order the Magic Drawers, and click here to order the E-Z Disc Dispenser.